In normal circumstances, openly calling for the dismantling of the NHS would usually exclude someone from being put in charge of it. Not in Theresa May’s cabinet. Once he got the job you’d have thought Jeremy would have at least got to know something about the basics of health care, such as patient confidentiality. In 2009, Hunt had to repay £9,500 of taxpayers’ cash in claims for his second home expenses. In 2010, Hunt gave a civil service job to the daughter of a friend – a Conservative Lord who’d been the director of one of Hunt’s companies. In 2010, as Sports Minister Hunt blamed ‘hooligans’ for the 1989 Hillsborough disaster – in which 96 Liverpool fans died, a third of them children or teenagers. In 2010, Hunt was caught hiding behind a tree trying to avoid being spotted going into a private dinner with the Murdochs. In 2012, Hunt and his advisors were caught leaking sensitive information to Rupert Murdoch’s office when Hunt was supposed to be handling the company’s bid to take over BSkyB. In 2012, Hunt was caught dodging more than £100,000 in tax in a property deal. In 2012, Hunt was in charge of the Olympics security fiasco, in which he paid millions of taxpayers’ money to private company G4S who were so incompetent the army and police had to step in. 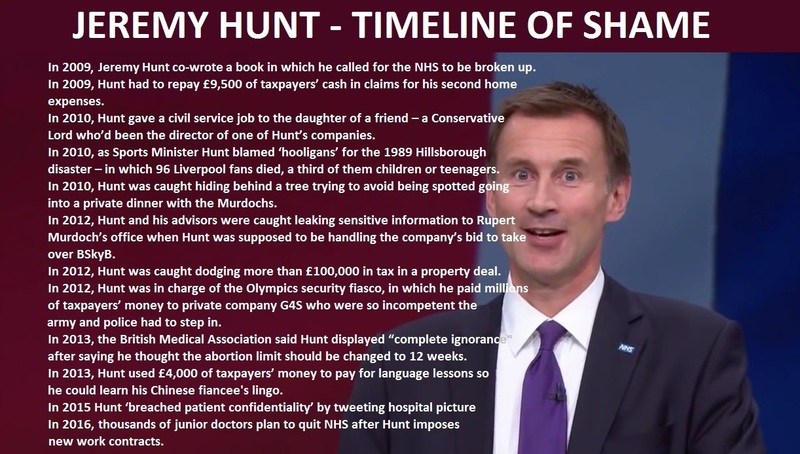 In 2013, the British Medical Association said Hunt displayed “complete ignorance” after saying he thought the abortion limit should be changed to 12 weeks. In 2013, Hunt used £4,000 of taxpayers’ money to pay for language lessons so he could learn his Chinese fiancee’s lingo. 1p for a 12-second phone call, 5p for a paper clip, 8p for a page marker, £700 on signs for one of his houses and £3,180 a year on stamps, envelopes and labels. And what do we get in return for all this money we’re paying out to him? A Health Secretary who’s breaking up the NHS and privatising hospital services, has managed to alienate the entire NHS workforce and who’s so incompetent it’s gone global. Just another of the incompetent Tory clowns now running our country. Thank goodness I live in Scotland where we are spared the incompetence he displays running the English NHS. But could those of us lucky enough to have an NHS which is nothing to do with him please also be spared having to read about him as “the (sic) Health Secretary? He’s not. He’s only the Health Secretary south of the border. Up here we’re much better served by our NHS: free prescriptions for all, less than 5% of NHS money going to commercial companies, and then only if it can’t reasonably be avoided. It may be different in the big cities even in Scotland, but up here in the far North West (of Scotland, that is) same-day appointments with our GP in our modern, fully-equipped teaching practice surgery are normal, our GP makes house calls, even dropping in while passing when my husband was seriously ill, and the receptionist at the surgery recognises my voice and greets me by name when I ring to arrange to get my regular prescription items, which I can usually collect at the surgery the following day. Admittdly, when my husband needed highly-specialised, hi-tec treatment for his particular kind of cancer he was told our ‘local’ hospital lacked the facilities and he would have had to travel on to a hospital some fifty miles farther on. Yet since we already live more than a hundred miles from our ‘local’ (and only) hospital such things are just a small downside of life in a remote, wilderness location to set against the many joys, and in any real emergency a helicopter will get you to the ‘local’ hospitable in about the same time, or less, that an ambulance would be able to achieve while pushing through thick city traffic in any city. In the end my husband chose to go even farther away, to Glasgow, where he could stay with our daughters and be treated in scrupulously clean (he says the cleaning staff were almost incessantly wiping down and sterilising any thing that wasn’t human) purpose-built specialist facility there, with its world-wide reputation for cancer research and treatment. Where also, and crucially, they had one of the particulary very new radiotherapy machines, costing prices that would make your eyes bleed that were me assay for his treatment. A year on the treatment there appears to have been a complete cuccess, not just achieving a remission but a complete cure. I mention all this to show how a small country with huge geographical challenges can nevertheless provide totally free health care at all stages, prompt access to GPs and can provide patients who need it with-state-of-the-art treatment delivered by world-class doctors. Of course the Scottish NHS isn’t perfect. But the more I read about the NHS in England I realise how lucky we are. And maybe the thing we are luckiest about is not having that running joke of a fool Hunt messing it up. P.S. Just by the way, our NHS is not in any way subsidised by England or anywhere else. It’s just that the Scottish Government makes health a priority and manages its funds so that it can achieve these outcomes. Furthermore, leaving aside any notions of oil monny, however the sums are done, or by whom, it is clear that Scotland pays into the GB exchequer either just a (very) tiny bit less than it receives back under the Barnett Formula or, as some calculations show, just a (very) tiny bit more. (All this is verifiable.) So we’re not running our NHS on English hand outs, as some, particularly on the right, choose to claim, even though they must know it’s untrue. We’re running an NHS within the ‘allowance’ we are given under the formula, (as if Scotland were some sort of adolescent incapable of managing more than pocket money) and we’re running it to meet the needs of the patients, not the profit-seekers because that’s how we, the people of Scotland want it to be; an NHS we are proud of and confident in using. But mostly because the people of Scotland believe that the profit-motive has no place in the Health Service of a civilised and compassionate nation like ours. Lastly, I should say we’re not gloating over how our service seems to be so much better than that farther south. In fact it grieves many of us deeply to watch from our safe distance as the NHS over the border has been systematically dismantled, piece by piece by Hunt and the rest of his ideologues in the Tory party. They may claim it’s safe in their hands. (But remember it’s the speed of the hand that deceives the eye.) They may claim the admire and respect it. But forget the words and look at actions and something very different becomes apparent. And that which becomes apparent gives no pleasure to us up here to watch. Particularly so because the Scottish NHS shows that when a Government really does want to protect the NHS it can, even without full control of its financial affairs, and there is no real, unbiased reason why the NHS south of the border has had to suffer. There is an alternative. And the truth is the Wrstmimster Government and mr Hunt just don’t want — for hard-line ideological reasons — even to countenance it. That’s always been the Tory plan. And in fact under their Health and Social Care Act the Secretary of state is NOT responsible for the NHS. That’s the job of Simon Stevens. Lord knows, I have no problem with this contirbutors happy experiences of the NHS in Scotland but I fail to comprehend why we even have a pretence that it is an NHS at all (the emphasis being on the N). Let’s face it, we don’t. Another Scottish referendum ASAP please, but this time one were the other constituent countries of the UK get to vote to join Scotland in it’s desire to tell westminster where to go! Tom Pride here gives Jeremy Hunt’s dismal record of demanding the tax payer pay for his every whim and indulgence, while demanding the privatisation of the NHS and grovelling to Murdoch. Mr Pride makes the point that someone who’s written a book demanding the privatisation of the NHS should be kept away from it. Except in Cameron’s cabinet, where it’s required thinking. What comes out this is just how typical Hunt is of nearly every politicians on the right. Just about every right-wing politician since Thatcher secretly or not so secretly wants the privatisation of the NHS. And they’re all clustering around Murdoch as the great newspaperman, who will somehow make them popular. Hunt’s even like Grant Shapps in wanting the taxpayer to pay for private language lessons. In the case of Hunt, it was Chinese. In the case of Shapps, it was Hebrew. Shapps also wanted the state to foot the bill for him and his lover as well. Different languages, same greed and venality. The solution is to get rid of both. Why do the British people tolerate such a disreputable and corrupt fraudster in any government position? These facts are obscene , how and I mean how does he get away with it???? We on the other hand are judged incessantly and continuously brought to task for any misdemeanors we may have been perceived to commit. Eg.paying back underpaid tax, because the tax office make mistakes, having an extra bedroom, earning more than 30,000 pounds and living in social housing. Cameron sort out your govt and sort out Hunt. Somebody should hunt him out of NHS. Destructive brain for selfish gains. Who voted for them? Next time vote for a party that will undo all the damage the Consevatives have done to this country! The Tories are in power under false pretences. They lied and lied and lied and stupid people believed them. And now they are moving towards a monopoly of power, with all the anti-Tory newspapers either closing down or in trouble, Cameron intent on impoverishing the Labour Party and the opposition beguiled by a leader who can never win an election. God help us in this country. The history about this man is astonishing for someone at his level even if a small percentage of the above list is correct. If he was applying for any job at any level he would struggle to get it given his track record yet he is in yet another high profile role judging others on behalf of the people he has continuously let down. It is not up to Mr Hunt to answer why he is still allowed to continue in government it is up to his bosses who act on behalf of us, the voters. These are not simple disagreements about how we are governed, these are genuine concerns that this man continuously works to his own agenda which in many peoples views not only suits his own agenda but that of his friends and associates and these should be taken seriously and answered. Forget the passed for the time been and lets simply ask if this man is acting in the interests of the people whilst handling the National Health Service or simply carrying out the views of one person, HIS personal views in a co-written book. If this is not a conflict of interests I do not know what is and he should be removed from his post immediately. Vince Cable was removed very promptly for imposing his own personal views on the Sky take over simply to be replaced by someone pushing as hard in the opposite direction, Mr Hunt which was ignored. Come on Mr Cameron, explain to the Country why this man is been allowed to operate in your government in an inappropriate and unsuitable manner over several years especially in such delicate roles …….. Have you not got anyone else in your pocket to replace him? Dear David. Time Hunt went has long past just like with another of your failed Ministers Gove who should have sacked long before you sacked him!! Osborne also as a failed Minister needs sacking! No moral fibre with all three of em! A disgusted middle of the road politically member of grey vote!!! How come that Jeremy *unt always seems to have the startled look on his face of a red fox suddenly caught in an oncoming car’s headlights?? Hunt is doing the job he has been given by Cameron ,to separate any Tory Minister from the collective destruction of the Welfare State would be a misnomer , just look at what Ian Duncan Smith is getting away with!! The Tory Govmt & their supporters do not believe in State Welfare Provision since coming into power they have successfully managed to set worker against worker ie,the private sector v the public sector pensions debacle , the public against those on Benefits and latterly demonising health care staff , Drs Nurses , Social workers etc etc . We are sleep walking back into the 1930s , & those most vulnerable in our society will suffer the most , we are living in an Orwellian nightmare for which I can see no end , we are becoming a One Party State .